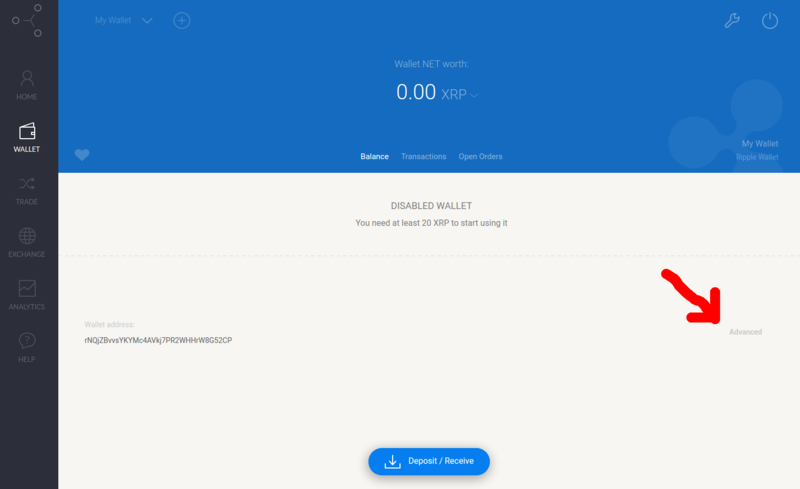 I'm making a very simple, easy to follow guide on how to trade XRP for PRX on both Gatehub and Rippex's desktop client. If you are new to trading, I will try to guide you through the process and explain some of terms used on both pages. 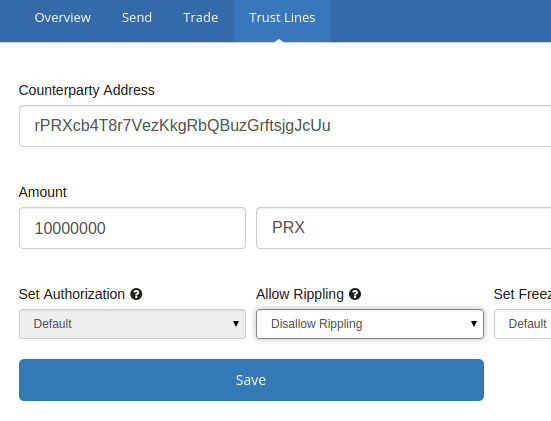 Please keep in mind for both Gatehub and Rippex you need to extend a trustline to PRX from issuer rPRXcb4T8r7VezKkgRbQBuzGrftsjgJcUu otherwise you can't hold nor trade PRX. On gatehub, visit your wallet screen. Enter your password. 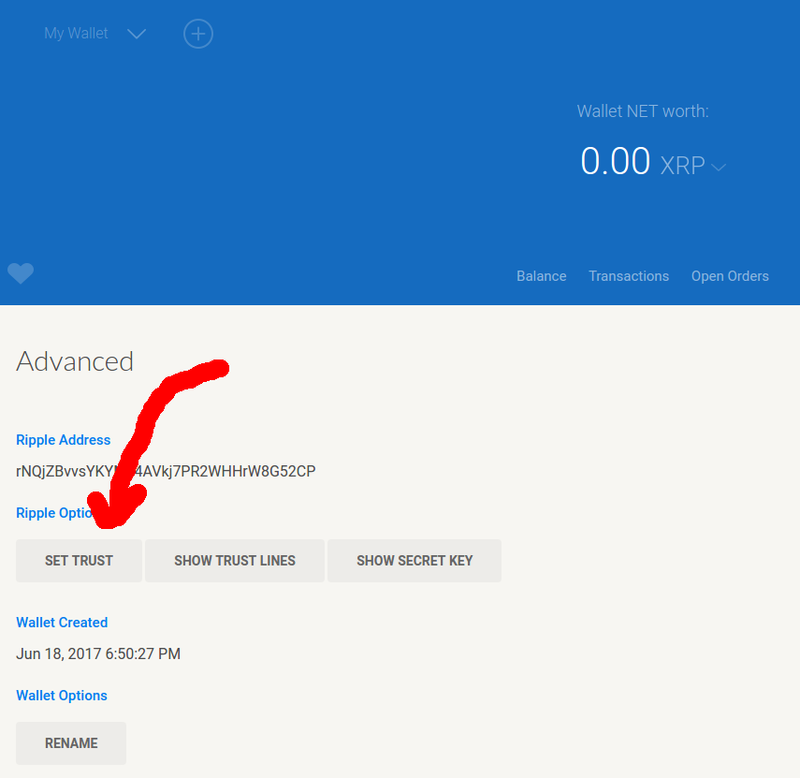 Keep in mind you need a minimum amount of XRP in your account to be able to set a trustline! And input PRX as the currency code. 1: Select you wallet you want to trade with here. 2: Last price is the last price an order went through on. 24hr change is the percentage change in price during the last 24 hours. 24hr low is the lowest price an order went through for. 24hr high is the highest price an order went through for. 24hr XRP Volume is how many XRP worth of trades were executed in the last 24 hrs. 3: If you click the double arrow inbetween the two currencies you can switch which side of the books they are on. I prefer having PRX on the right side, since it is a little difficult seeing the full numbers on orders the other way. 4: This lists the last trades that went through. 5: This is the bid side of the orderbook. In this screenshot, the top order is offering 10526.31 PRX for 0.95 XRP. 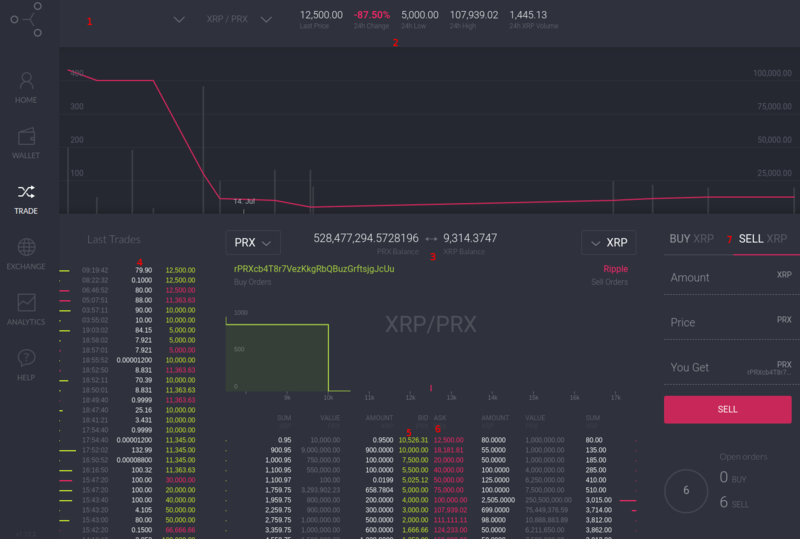 If you ever get confused by which side of the orderbook is what, just think about the goal of a person selling PRX, it's to sell it for as low of a price as possible, preferably 1PRX for 1XRP! On the otherside, a PRX buyer wants to spend as little XRP as possible, so they want a big PRX price per XRP. 6: Ask side of the orderbook. These are orders trying to buy PRX for XRP. So the top order is trying to sell 80 XRP, at 12500 PRX per XRP, for a grand total of 1 million PRX. 7: This is where you can submit an order. If you click the sell XRP tab, you can submit a sell limit order. These orders will stay on the orderbook until they are filled or you cancel it. So, for instance, you can sell 1 XRP, for 12000 PRX. This order would go on the orderbook but would not be immediately filled. However, if you tried to sell 1 XRP for 10000 PRX, you'd buy some PRX immediately, since there are orders that can fulfill that request. 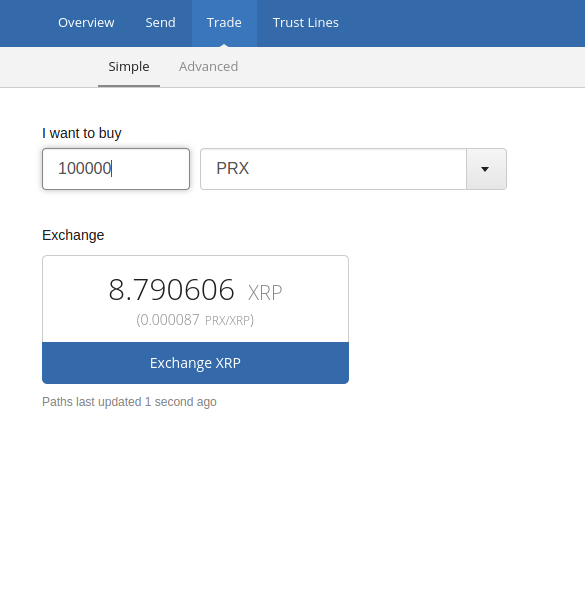 Alternatively you can buy XRP with PRX you want to sell. It is the same process, just reversed! Visit the trade tab, make sure you're on the 'simple sub tab'. Select PRX from the currency drop down, enter how much you want to buy. Enter XRP in the first pair. 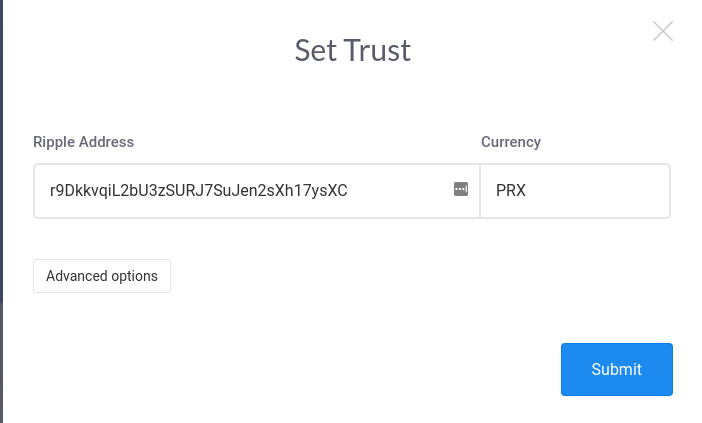 Next, actually type and enter PRX in the next counter currency box. Enter rPRXcb4T8r7VezKkgRbQBuzGrftsjgJcUu into the Counter Gateway box. If you scroll down you can see a buy and sell box, and the most recent trades and the orderbook. It is the exact same situation as with Gatehub, read through that section if you're new to trading with limit orders :).